What do you look for when buying a numbing agent for a tattoo, piercing, micro-blading, waxing, or other painful procedure? There is only one answer - you want it POWERFUL! With that single goal in mind, we scoured the world, and spent years perfecting the strongest numbing product in the world. Combining science, art, natural remedy, and a hefty dose of raw unbridled power. We have created a monster of numbing strength, that will leave you astonished at how comfortable your procedure can really be! Available individually, or in a counter display pack for 20% off complete with a free display box to boost your shops profits. *Not for use on or around the eyes* For Best Numbing Results Apply thick even layers 3-5 minutes apart until you have reached your optimum level of numbification. Some people only need 2 layers, others may need more depending on their body chemistry. Use as much as you need for your optimal experience. Consider also purchasing a spray for longer procedures that need you to stay numb for longer. Powerful Pain Relieving Power Goes To Work In Minutes, And Lasts For Hours! Deep Penetrating Formula Delivers Lidocaine & Our Natural Numbing Agent Where Its Needed Fast! Enhanced With The Natural Numbing Power Of Kava For A Powerful Numb That Outperforms The Competition, And Lasts For Hours! Relaxing Tropical Scent That is Pleasant And Delightful! Gold Colored Cream Rubs In Clear For An Optimal Experience! 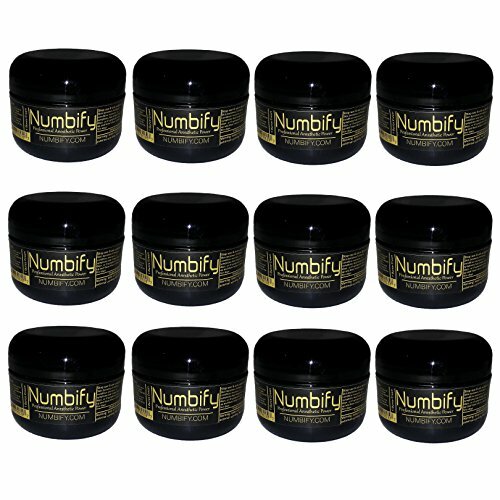 If you have any questions about this product by Numbify, contact us by completing and submitting the form below. If you are looking for a specif part number, please include it with your message.